Brian is a life long fitness enthusiast. For many years he was a competitive runner, having completed numerous marathons, including Boston, Dublin, Marine Corps and dozens of local road races. He has also participated in long distance cycling and completed 2 bike trips to Canada in addition to several Century (100 mile) rides. To complement his aerobic training, Brian has practiced power yoga, and several different styles of martial arts. 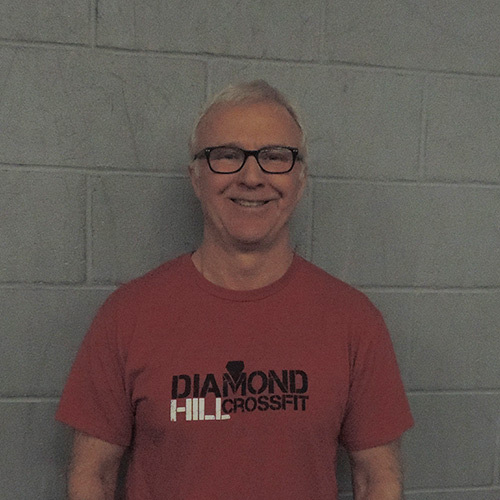 In 2009 Brian began training in CrossFit and the following year became a CrossFit Level 1 trainer. In 2011 Brian decided to end a 30 plus year career in the printing industry and re-invent himself as a fitness professional. He is now working as a certified personal trainer and a CrossFit coach. He works with individuals, small groups and large groups. In addition to training our athletes Brian trains individuals out of his garage gym. He also works with special needs groups, providing fitness training through programs sponsored by the Attleboro YMCA. He strongly believes that improved fitness is the key to a happy, healthy life.